We're travelling from DC to Sydney, using the above route. (Google Flights link). Is there any reason for this weird requirement at Vancouver? Shouldn't custom be cleared in Toronto, our first stop in Canada? 1h30 doesn't seem nearly enough for transiting. 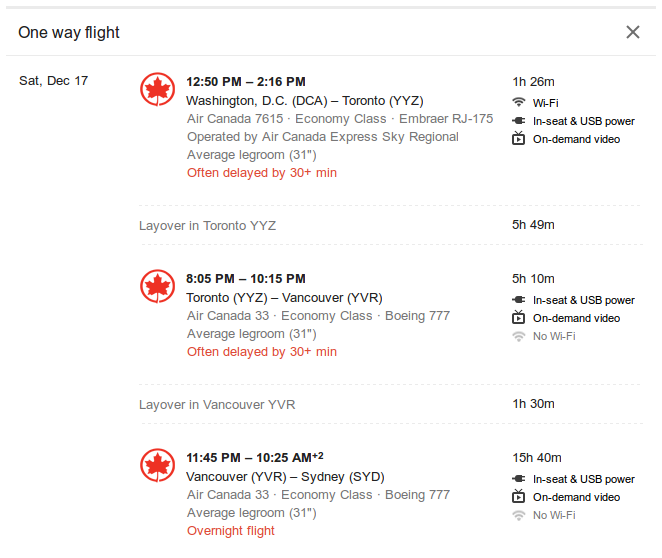 However, this seems like AirCanada's routine Toronto-Sydney flight, and they supposedly do this all the time. Does anyone have experience transiting on this route? Is 1h30 okay? Yes, you will go through Canadian immigration and customs in Toronto, not Vancouver. I am not sure why it says what it says; maybe it means for the return flight. Not the answer you're looking for? Browse other questions tagged air-travel canada air-canada or ask your own question. Vancouver to Toronto by train in December: How warm is the cabin?